Display of sound objects, instruments and scores developed and utilized in project “bernu rits” by architect Maksims Shentelevs and composer Jacobs Nimanis. Exhibition is open from Wednesday to Sunday from 12pm- 6pm until August 30th. Free entry. Welcome! These musical instruments were made for a play "4est" in the frame of theater festival Homo Alibi in 2012. The subject was recycling and four authors and performers, - Rudolf Alban Bekich, Reinis Suhanovs, Janis Znotins and Jekabs Nimanis) decided to make scenography and music from things they found. The instruments have been later used in different performances. 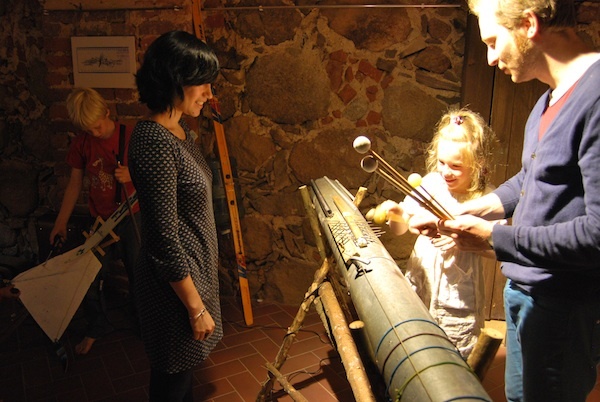 Musical instrument is a specific tool for producing certain sounds. Each one is designed for its purpose and is refined by generations and ages of cultural processing. When making sound by using any of existing musical instruments we expose ourselves to the whole complex of cultural legacy related to this certain tool. What if we invent and build sound instrument of our own design? Device based on personal understanding and interest. An expression of our own imagination. What is the definition of sound and technicue of playing ? Is it music? Even if its not stright continuation of previous musical tradition. Is it still subject of the cultural processing ? Graphics dispayed represent musical ideas that arise during meetings of bernu rits. Ideas fixed on paper later get developed into scores. These materials guide artists during their performances, discribing sound texterus, movements, lights, emotional tonalities and mythological beckground placed onto timeline or plan of the performance area. is a sound art project, developed in 2007 in Riga by a group of like-minded architects. BR is a platform for collaboration in fields of sound, communication and space exploration amongst preconception free enthusiasts.